NICHE developer LBS Bina Group Bhd (fundamental: 1.00; valuation: 2.40) has a sizeable offering in the affordable housing segment, and properties priced between RM200,000 and RM500,000 each are expected to drive the property market this year, according to Deputy Finance Minister Datuk Chua Tee Yong when launching the Property Market Report 2014 last Tuesday. Closing at RM1.50 last Wednesday, LBS’ share price is about 4.5% lower year to date, despite booking stellar results for 2014. JF Apex Securities has LBS as its top pick among small and mid-cap property developers, citing its projects with an estimated gross development value (GDV) of RM18 billion across different localities, product offerings in the mid to high-end level, strong cash flow in relation to the staggered payment for the disposal of its China assets (HK$200 million promissory note or RM93 million cash to be received annually from 2015 to 2017) and sturdy balance sheet of 0.2 times net gearing. In a recent March 2 note, JF Apex maintained a “buy” recommendation and RM2.03 target price, saying that it was at a 55% discount to LBS’ revalued net asset value per share of RM4.50 and implied 14.7 times 2015 earnings. If the research house is right, there is a 35% upside potential for the stock. 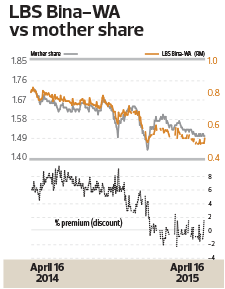 There may also be an upside potential for the developer’s warrant, LBS-WA, which was trading at a 1.32% discount to the underlying securities based on last Wednesday’s closing of 49 sen. LBS-WA has a RM1 strike price with one-to-one conversion ratio. It expires on June 11, 2018. LBS has been buying back shares on the open market. Filings show that the company had 11.78 million shares or 2.23% of its share base held in treasury as at April 15. Its net profit for the year ended Dec 31, 2014 (FY2014) jumped 47.6% year on year to RM70.1 million, after stripping off RM336 million one-off gains on disposal of its China assets in FY2013. Unbilled sales of RM543 million as at 4Q2014 underpinned future earnings for close to one year, being 0.8 times 2014’s top line, says JF Apex’s Lee Chung Cheng in the March 2 report. For 2015, LBS plans to launch projects with a GDV of RM2 billion and an average selling price of between RM400,000 and RM700,000 per unit in Puchong in Selangor, Batu Pahat and Tampoi in Johor, and Gohtong Jaya and Cameron Highlands in Pahang.